2003 - Finished our film in time, but were unable to get it on the tape they required. That hurt. 2004 - Finished our film in time, made the deadline, had it screened, didn’t make the finals. 2006 - Finished our film in time, made the deadline, had it screened, made the finals, didn’t place. It’s 2007 and I’m proud to say… We won 3rd place in our division. 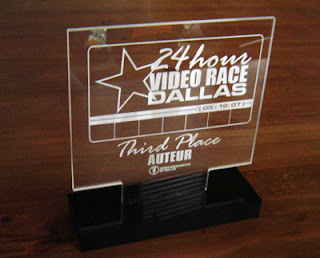 Yeah, it’s not first or second place, but we did win something for our efforts. See semi-snazzy trophy below. With this pattern, maybe we’ll get second place in 2008 and win in 2009? Could be. What was disappointing to us is that we were unable to do everything in the film that we had planned. We were getting down to the wire in the editing stage, trying to improve some audio and ran out of time. We left off a funny joke and didn’t get the end credits added, which would have ended our film on a laugh (in theory). Hey, it’s a race and that’s what it’s all about. We can only blame ourselves for not turning in the film we wanted to. But we did place and we’re happy with that. The night of the race, we were happy just getting it in on time. We made it in at 11:58.